In the middle of “A Lifelong Love” by Gary Thomas, I read paragraphs aloud to Greg. They reminded about where we’d been or our friends’ current marriage struggle. The words were true and offered hope that people can change. I’m so grateful I’m not the same person Greg married 12-plus years ago. I’m sure he’s glad too. There were some hard years in there – mostly because I didn’t know how to love like Christ loves. Of course, I still haven’t mastered it but I’ve come a long way. And that’s what Gary Thomas’ book is about. “A Lifelong Love” encourages people to make intentional choices in their marriages and equips readers with truths that can help them thrive in their marriages and lives. The subtitle alone prompts a question worth asking: What if marriage is about more than just staying together? 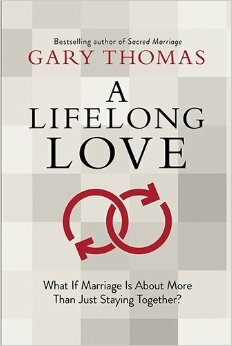 “A Lifelong Love” builds on Thomas’ “Sacred Marriage,” which shows how God designed marriage to make us holy more than to make us happy. Now, be encouraged to change the world around you, starting with your home and overflowing into the other places you go. ABOUT THE BOOK :: Discover how to live out a sacred marriage. You believe your marriage has eternal purposes. you long for it to reach beyond your home and encourage others. But what does it look like to have a spiritually intentional relationship in the midst of dirty dishes, work deadlines, and car pools? This book includes discussion questions for couples. Hardcover. 316 pages. Official website. ABOUT THE AUTHOR :: Gary Thomas is writer-in-residence at Second Baptist Church in Houston, a frequent guest on Focus on the Family and FamilyLife Today radio, and a popular speaker. His award-winning books, including The Sacred Search, have been translated into over a dozen languages and together have sold more than a million copies worldwide. Thomas and his wife have been married 30 years and have three children. Author website. Twitter. Facebook. AND A GIVEAWAY :: One of you will win your own copy of “A Livelong Love” by Gary Thomas. Use the Rafflecopter below to enter. A winner will be selected randomly Friday, Oct. 31. Many thanks to FlyBy Promotions/Propeller Consulting LLC for providing this prize for the giveaway. Choice of winner and opinions are 100 percent my own and are not influenced by monetary compensation. I did receive a copy of the book to review. We've been married for 5 years, and loved Sacred Marriage. This one looks amazing – I would love to read it!! Your story is one that's encouraging to me about overcoming and trusting God. And I'm right there with you – I missed some opportunities early on with books like these. It's good to see you here, Kristin! You have so much more wisdom than I did five years in. 🙂 Glad you entered to win, Kayse! Yes, me too, Lori! Sounds like you and your husband are committed though, despite the obstacles that have come with military life. I love how you share your story! Hi Kristin! Heath and I just celebrated 10 years this month!! What a journey it is to be made one together in Christ! I will always give God all the credit because His third strand to our 3 cord marriage is what keeps us strong. I read probably every solid marriage book I could get my hands on during our dating relationship and engagement, but I must say I need just as much wisdom now as ever! Now that we're (newish) parents, we face different struggles than before. I love your blog and what you share with us all! Ah, yes, parenting … it throws another entirely different element into marriage. But with God as your foundation, you'll make it. Thanks for your comment and kind words. I'm glad you shared here, Leslie!